On Saturday, my kids were at a snow-tubing birthday party in the Craigavon Ski Centre (amazing idea for a party - really handy for Belfast and such great fun...kids had a ball) which meant I had a couple of hours to kill in the area and the first person I thought of was my friend Danielle, who also happens to be one of the Personal Shoppers in Debenhams in Rushmere. Danielle and I met years ago whenever we both started blogging and you may remember me featuring her on here before when she owned a boutique in Lisburn. 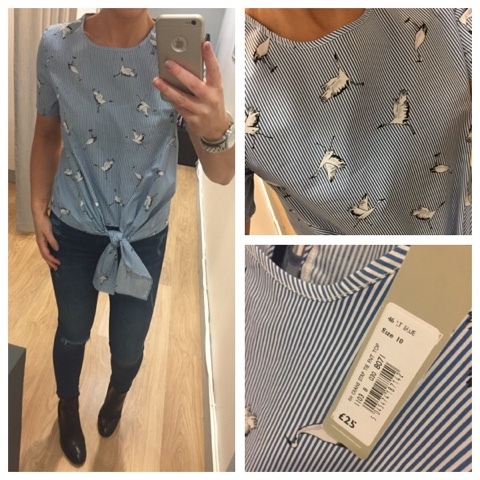 Moving on a few years now, Danielle's shop has moved online and she's doing more of what she really loves - personal styling/shopping. 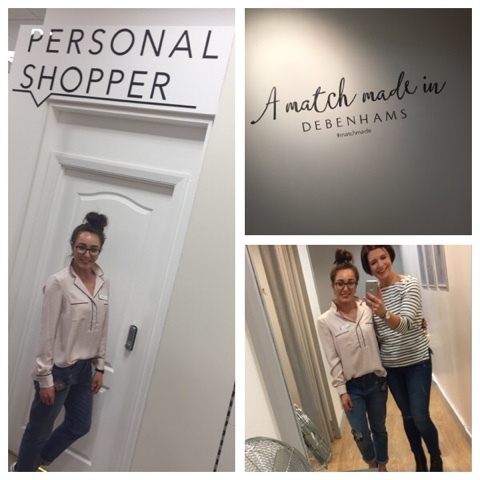 As well as working in Debenhams, Danielle also does personal styling appointments in her own right where she's not affiliated to any particular shop. I need her to bring me around Zara some day! As this was more of an impromptu appointment, instead of picking things for me in advance, Danielle instead walked around with me for 15 minutes or so and showed me some of the pieces she really likes from all the collections and between us, we accumulated rather a bit to try on. 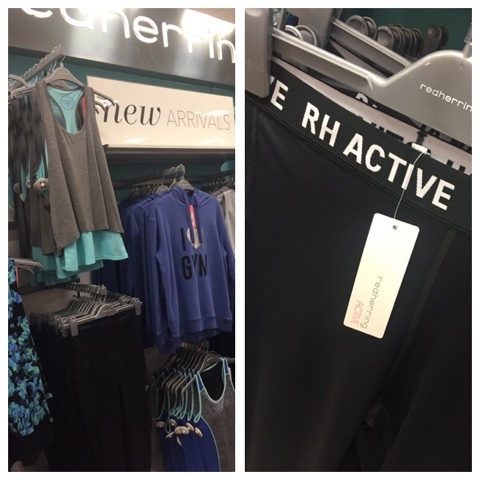 Some of it was stuff I knew I would like, others things I wasn't so sure about but was willing to try - because that's what's great about going to a personal shopper - it's about pushing yourself outside the comfort zone of buying the same old stuff over and over again! Starting with this first top from Red Herring which is a nod to a couple of trends out there now - striped shirt style tops & tie waist details. I was unsure about the bird pattern but actually I loved it once I had it on. 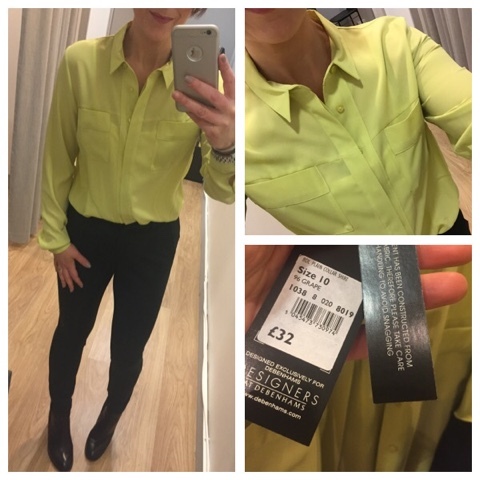 This is a size 10. 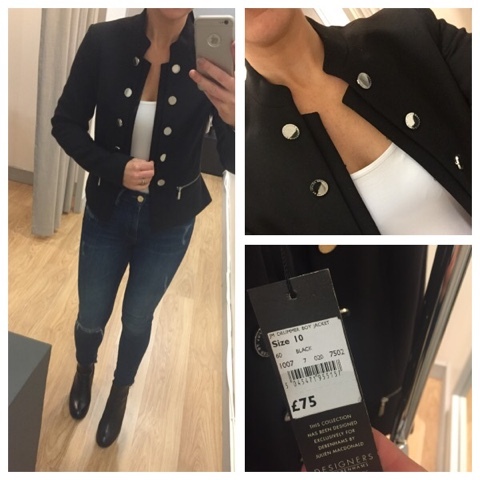 Next a fab jacket I just had to try on as I loved the nod to military but without it being full on marching band. The nip at the waist is so flattering and it's got eyelet fastening rather than buttons. It comes up small though - this is the 10 so I'd want a 12 in this one. 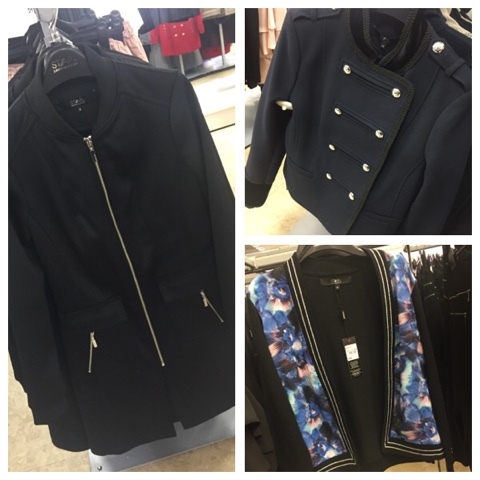 Just a gorgeous weight of jacket and a great piece for work wear as well as casual wear. We saw SO much blush everywhere (more below!) and I was lamenting to Danielle how I struggle to wear blush as some of the tones of it can really wash me out. 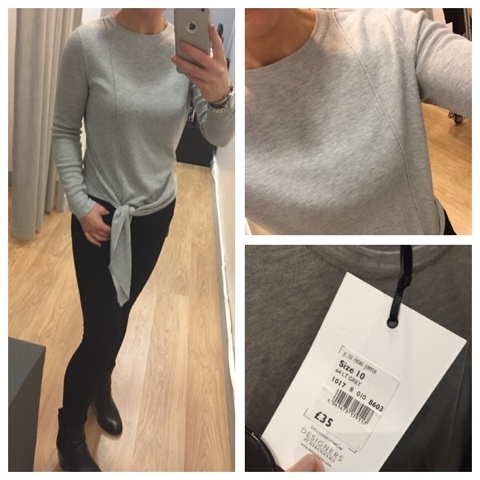 So she immediately picked this jumper which has block colouring in navy and black, as well as the blush. It definitely makes it work for me and I also liked how the blush panel is loose at the front and so flattering. 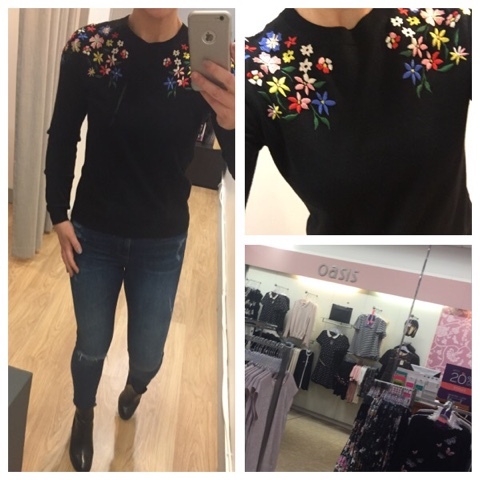 I spotted this next jumper in Oasis and had to try it on. Forgot to photograph the label but it was a size S. Gorgeous embroidery and it has a ribbon tie at the back of the neckline. 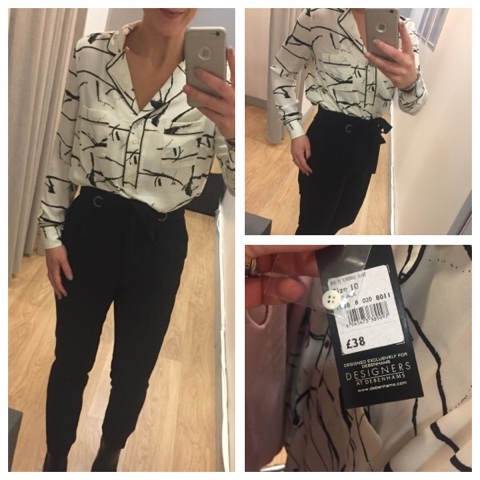 This blouse is the monochrome version of the blush and black one Danielle is wearing and it's a very wearable nod to the pyjama trend that I think many of us can struggle with. I was surprised at how much I liked this shape on me. Danielle encouraged me to try it with some high waisted trousers. 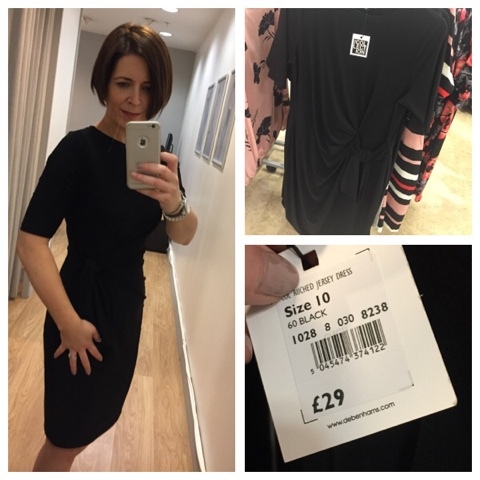 I liked the waistline and could see how flattering they is on my body shape but the peg leg shape doesn't work for me and I know I'm not alone here as I've had other readers contact me about this one. The reason? Large calves....thanks to years of Irish dancing. Any kind of trouser that's neater on the bottom half just catches on the calf and it's super annoying! So I need to look at a higher waisted wide leg instead perhaps? But I'd have to wear with a less voluminous blouse to balance it out. Again, on the blush theme, I decided to try this next blouse because it doesn't have the blush right up at my neckline. However the shape is not good - even with a tight bottom half, it adds bulk. Looking back at the photos, I'm struggling to work out who this would look good on - not a good call Mr Julian MacDonald! Another tie waist top and again, I'd not have tried this as I'd think it would add bulk to my slimmest part. But I loved it and it's hugely flattering for hiding mum tum. This next top was my overall favourite and if I wasn't coming down with going out tops, I'd have snapped it up. 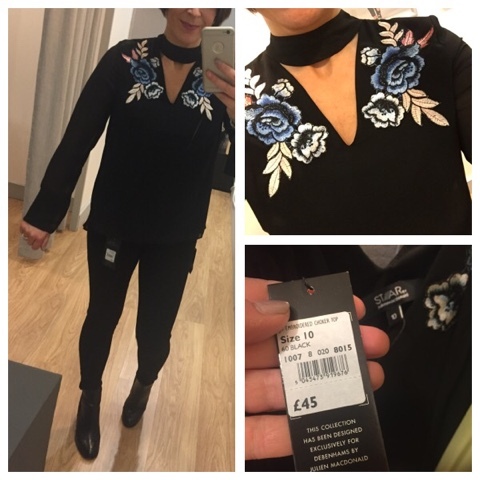 I adore the choker detail and the the embroidery gives it a fab lift and with the denim blue, will ensure it works just as well with blue jeans. 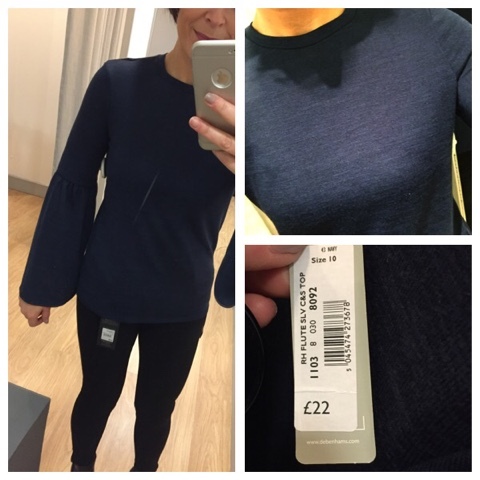 Wanting to try the bell-sleeved trend without adding bulk, this next top ticked the boxes for me as the jersey is light weight and close fitting. 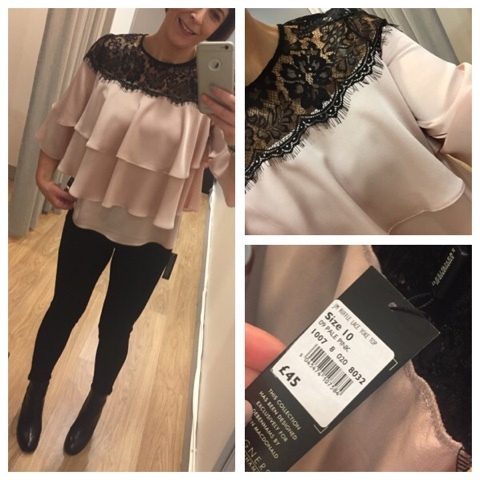 A complete bargain for £22 and it also comes in a blush marl colour way. I succumbed and bought this one! This denim dress is super versatile. 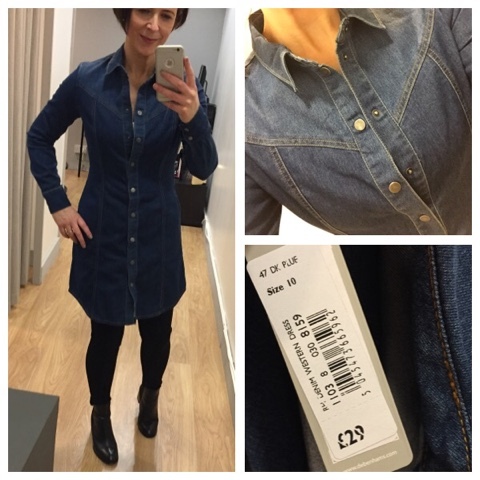 As well as working with tights and boots now, it would work with sandals and bare legs in the summer and when worn open, it's a lovely denim longline jacket! I fell for this next knit also. It had the blush colour I love but with black to break it up so it works better with my colouring. But it was the open lower sleeve that won me over - it's got an opening from the elbow to the wrist. Just such a cute detail. For £20! 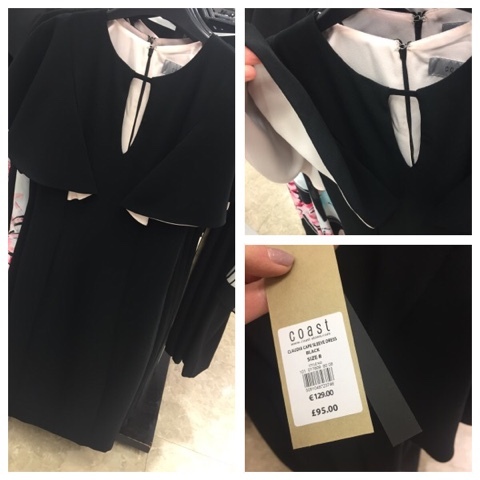 Danielle asked me to try this dress on as it looks like nothing on the hanger but is amazing on everyone she's tried it on. It nips you exactly where it needs to and has a flattering ruche detail on the waist and perfect half sleeves. All for £29. Workwear essential. 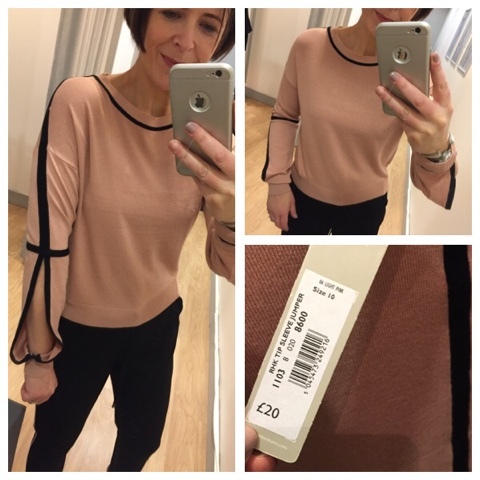 It comes in a few different colour ways from The Collection at Debenhams - but I can't find it online! 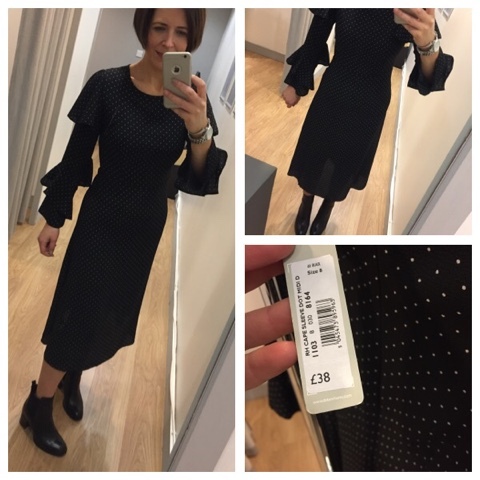 Finishing with this dress which I wasn't going to try on but then Danielle told me how amazing it was on and how it would look fab with a biker jacket and ankle boots. So I tried it and fell in love. Just stunning on and I have a work event in March that I think it's going to be amazing for. But I can't buy it this month...aarrgghh....I need to STOP shopping! And just a few things I snapped going around the shop, starting with this absolute classic. It's a cape detail black dress from Coast with just a peep of blush from underneath the cape. It could work for a wedding, funeral, party, work event. Simply stunning and one that you'd wear forever. Blush was everywhere - I love it but it doesn't always love me. It's important to get the right shade of blush I find. 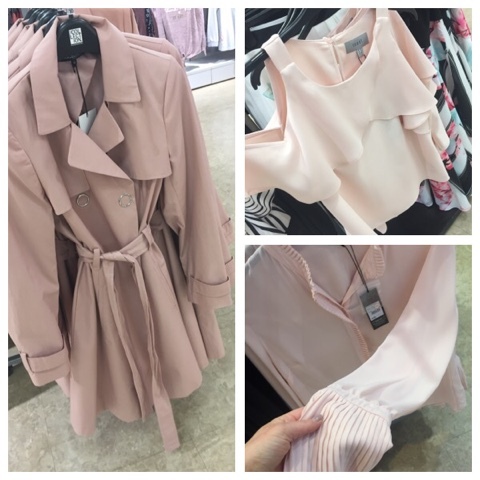 Loved all these jackets from Star by Julian MacDonald....redeeming himself after the disaster that was the blush and lace ruffle blouse! And I think that's it - believe it or not, there were more photos but it's taken me 3 days to get this far! For anyone interested in contacting Danielle, you can pop over to her blog and styling business website on this link. 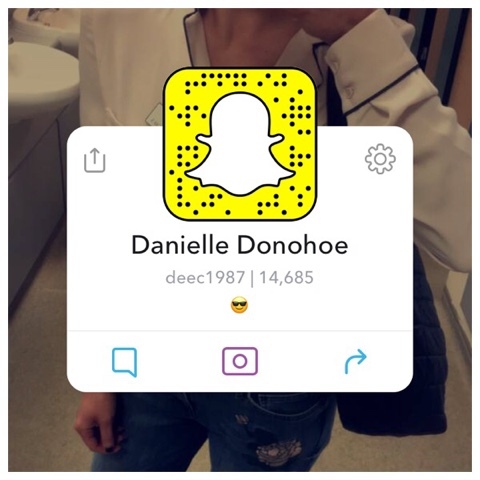 You can also follow her on Snapchat - here's her snapcode!